On board the train EC179 from Berlin to Prague, although we get off at Dresden. First order today was breakfast. We went to the buffet at the restaurant next door again, a little earlier today. Again we had the chocolate muesli and some of the excellent bread. I had scrambled eggs, but no sausages today, while Michelle tried a boiled egg, which turned out to be firm yolk, but not really hard. There was also smoked herring and cooked crayfish today, both of which I tried. The herring was nice and the crayfish tasted good, but was very fiddly to peel. After eating, we packed our bags and checked out, leaving the bags there for later pick-up as we went out for our last day's sightseeing in Berlin. We stopped off on the way to Friedrichstraße station to buy bread rolls and cheese and water at the same corner store as yesterday. Michelle only got one roll today, as she had two apples to get through. Then we retraced our steps on the metro to Sophie-Charlotte Platz. This time pausing to take some photos of Zoo Station in recognition of the U2 song. 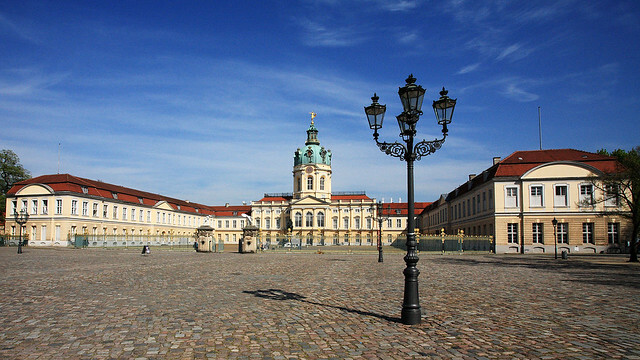 We walked back to Schloss Charlottenburg, determined to see the interior denied us yesterday. But before taking the 50-minute guided tour of the ground floor of the Altes Schloss, we went through to the new wing and the only toilet. We bought tickets for the new wing self-guided tour, then used the facilities. Refreshed, we headed back to the Altes Schloss for the guided tour, which for some odd reason required separate tickets - it seems the old and new sections of the building are run completely independently for some reason. The guided tour was in German, but there were bound pages in other languages for people to take along, only they were all mixed up in the labelled language trays. A French couple ahead of me grabbed one from the "Français" tray and discovered it was in Spanish, while I took one from the "English" tray and it turned out to be French! So I gave them my French one ("merci!") and dug through the pile until I found one genuinely in English. The guide took us through a bunch of rooms which displayed baroque and rococo decorations and furnishings. 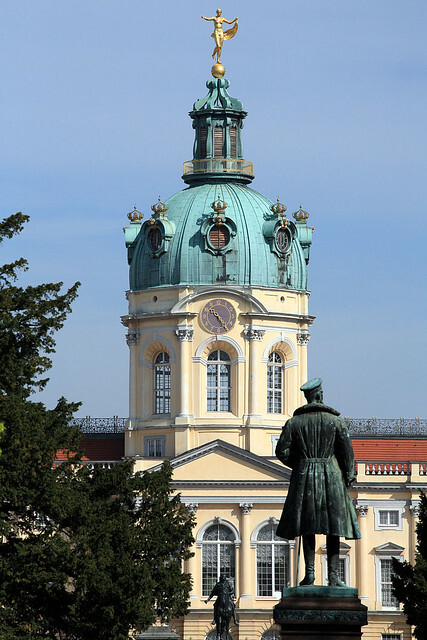 Much of the Schloss was damaged in World War II, but a lot of it has been restored using old photos and paintings as references. A lot of the ceiling frescoes for example, although stunning, are reproductions. Some rooms have been left with blank white ceilings because there is no record of what was originally painted on them before they were destroyed. A very few rooms were not destroyed and retained the original 1700-era decorations. Much of the furniture was also authentic, having been removed for safe storage during the war. While the tour was interesting, there were only a few really stunning rooms, like the Mirror Room, with the walls adorned with alternating equal-width panels of mirrors and patterned green silk damask. The most stunning room was the Porcelain Room, containing over 2,700 pieces of blue and white Chinese porcelain, each ensconced on a custom carved lintel or frame around the room. The guided portion over, we went upstairs to examine the upper level by ourselves. This consisted mostly of rooms housing museum-like collections of things owned by the Prussian royal family, including a huge silver service set for 50 people, a royal wedding gift from a coalition of about 100 towns. There were also the only remnants of the Prussian crown jewels: a couple of gold crowns, a sceptre, an orb, and a sword, plus a black iron box in which they were stored. We went over to the new wing for the self-guided audio tour, which turned out to be much more interesting than the Altes Schloss section. For one, there was a huge and magnificent ballroom, with windows out the north and south sides of the 42-metre long room. It had two double doors at each end, but one opened out over the staircase - it was there only to provide symmetry in the room design. Several of the rooms were decorated lavishly in various colours, with either silver detailing and carvings or gilt-plated, providing a changing colour spectacle as one wandered along the length of the wing, entering one room after another. Downstairs, the rooms were full of paintings by various French masters, including a very famous one of Napoleon on a horse that I recognised as soon as I saw it. Speaking of Napoleon, he apparently slept in one of the bedrooms upstairs one night before conquering some place or other. The queen refused to sleep in that room after that and had another room made into a new bedroom for her. The tour done, we had lunch, sitting on a bench on the front lawn in front of the wing. 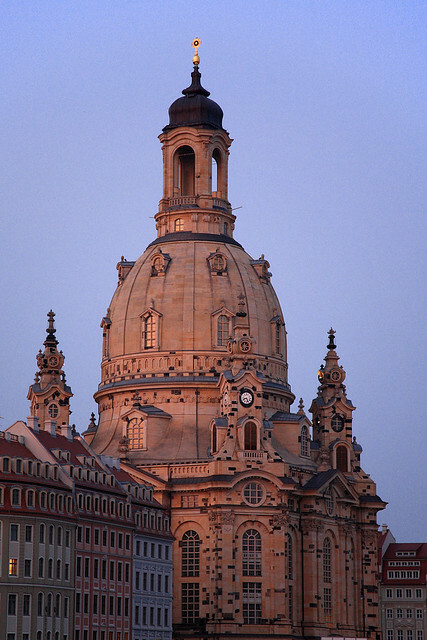 We decided to head back to the hotel to pick up our bags and head to the Hauptbahnhof for our train to Dresden. We retraced our steps to the metro and back to the hotel, stopping at a Kamps near the hotel (sort of a cross between a Baker's Delight and a Michel's Patisserie, with breads, rolls, pretzels, and pastries). Michelle got a cappuccino and pretzel, while I got a pastry thing for the train trip. It was sort of like a berry crumble; it was huge, but I was convinced by the two guys in front of us getting one each. 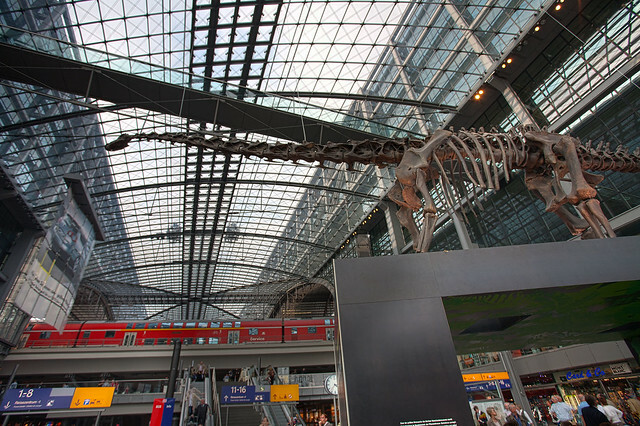 We collected our bags and began the long plod back to Friedrichstraße with them, where we got the S-Bahn one stop to the stunning new Hauptbahnhof, which was a huge airy structure of glass panels supported by thin metal sections. It had five levels, the top and bottom being train platforms, with the middle three being concourses of shops, all connected by a dizzying void showing all the floors connected by a latticework of escalators. On display near the south entrance at street level was a huge Diplodocus skeleton - something I'd seen in posters all over town. Apparently it belonged to a natural history museum that was being renovated and so was on temporary display in the station. It was cool, and I got some photos. I also took a bunch of shots of the amazing architecture. The first thing we did was check with a Die Bahn ticket office that we didn't need to do anything with our printed e-ticket. The man behind the counter looked at our ticket when we asked him and said, "No. This is the best ticket in the world. That's all you need! Catch your train on platform three." 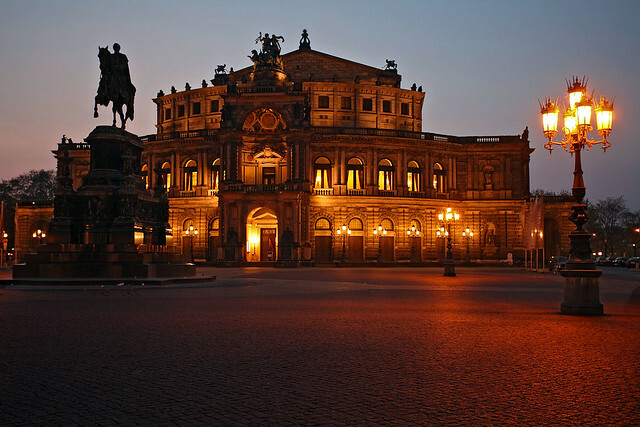 The next order of business was phoning our hotel in Dresden to let them know we'd be arriving around 7pm. I acquired a phone card from a T-Punkt store, resplendent in its bright pink logo colours. A quick call to Hotel Kipping resulted in swift assurance that we would be met on arrival, then we wandered the concourse a while to kill time before our train left. We used the huge "WC Centre", which cost €0.80 to use, but was very clean and nice. As we left, we overheard an Aussie woman talking on a phone - we were tempted to say hello, but she was obviously busy. We bought some water for the trip then went down to the platform to wait for our train. A quick check with a lady from DB assured us that we were in the right spot to board our carriage when the train arrived. Of course, it was spot on time and left as soon as we boarded and found our seats, immediately near the door we'd used. The train sped south through a lot of forest, interrupted by fields and small towns. We saw a lot of vast fields of yellow flowers; I think it was flax being grown for linen and linseed. 22:30 Room 12, Hotel Kipping, Dresden. The train arrived on time (of course) at the magnificent Dresden Hauptbahnhof, which is undergoing some reconstruction work on the south side. We had to take a short detour to exit on to Bayrischestraße, but soon located our hotel, just a short stroll down Winckelmannstraße. Hotel Kipping is a free-standing square building, three storeys tall, in a quiet street. It seems to be an old manor house converted into a hotel, with a restaurant in the basement where the reception is also located, accessed by a back door down a set of stairs from the street. We checked in and the friendly guy explained our room was on floor 1, and to get back to reception press -1 in the lift, since it was on floor -1. We dropped our bags in the room, which is huge and elegantly decorated with plaster mouldings, carved wood door lintels and frames painted to match, all the furniture a blue-grey colour, the furniture including a full leather sofa and two matching armchairs, wardrobe, writing desk, and TV cabinet. 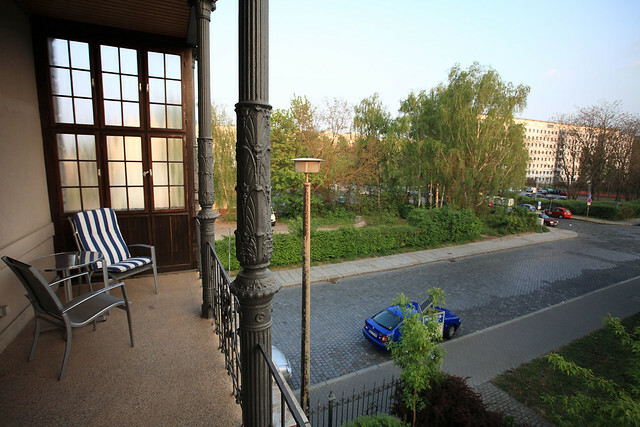 We also have a private balcony with a view south down the street. We showered and changed for dinner, then left the hotel, dropping the key at reception as requested. There was a hole in the reception counter marked "Schlussel", which I assumed meant to drop the key in there. When I did so, there was a huge thud as the heavy brass keyring crashed straight on to the floor below the counter. I think people in the hotel restaurant turned to see what had happened, but we beat a hasty retreat and dashed out to the streets of Dresden. Armed with camera and tripod, we were excited and determined to explore this new city a bit before grabbing dinner and retiring for the night. With the sun setting, it was a prime time for photography. We walked north along Pragerstraße, which has been recently converted (by the looks of it) into a vast open shopping plaza with a central area of fountains surrounded by shops in modern glass buildings. Crossing over to the Altmarkt area, we got our first glimpse of the truly old Dresden, with the Kreuzkirche looming heavily over the dug up Altmarkt square, which was apparently being renovated somehow. In the middle of the vast area that was being dug up was a lone untouched phone booth, bright pink with the T-Punkt signature logo colour, and inaccessible amidst the fenced off soil. We continued up Schlossstraße and turned left at the Schloss to emerge in Schlossplatz and Theaterplatz, surrounded by the magnificence of the Hofkirche, Semperoper, and Zwinger, each providing an amazing piece of baroque architecture in itself, but arrayed as they were around one huge cobblestoned square in the fading evening twilight, lit by floodlights and light from Victorian-era lamp posts, it was simply magical. I spent about half an hour taking photos in the twilight, then we started to walk back. We stopped at an Italian place offering pizza and pasta. The waitress didn't come to show us to a table and I was wondering what was going on when Michelle said that she'd waved us to take a seat. We sat and pondered the menu in German, deciphering enough for Michelle to order a pizza Italiano, with fresh tomatoes, basil pesto, and mozzarella on it. I ordered a spaghetti carbonara, which turned out to be disappointingly oily, as though smothered in butter. Thankfully, Michelle's pizza was much better, and large enough for the two of us, probably even if I hadn't eaten some of my carbonara first. Dinner over, we wandered back to Hotel Kipping to turn in for the night. When we asked for our room key, the man at reception at first looked at the board on the wall and then, when he couldn't find our key there, bent over to examine the floor below the hole in the counter, where he found and picked up our key. Last updated: Monday, 25 January, 2016; 01:11:59 PST.